What are the 10 reasons you should be looking at the Instant Pot Ultra 6 Qt 10-in-1 Multi-Use Programmable Pressure Cooker? It’s a pressure cooker, slow cooker, rice/porridge cooker, yogurt maker, cake maker, egg cooker, saute/searing, steamer, warmer, and sterilizer, that’s why. Read the review below and find out if those are reasons enough to get one for yourself. The Instant Pot Ultra 6 Qt 10-in-1 Multi-Use Programmable Pressure Cooker takes pressure cooking and slow cooking to a whole new level. Not only does it take the place of 10 small kitchen appliances, you can also customize its cooking programs exactly how you want. Are you familiar with previous generations of Instant Pot? If not, click here to read my post on the Instant Pot DUO to learn about this fantastic multi-use appliance. The Instant Pot DUO replaced your pressure cooker, slow cooker, rice/porridge maker, sauté/browning pan, steamer, yogurt maker and stock pot warmer. Now the Instant Pot Ultra 6 Qt 10-in-1 Multi-Use Programmable Pressure Cooker also adds the functions of a cake maker, egg cooker, sterilizer and most important of all, the programmable Ultra feature. Steam Release – is now a button, replacing the handle. It automatically returns to the sealed position so that you don’t have to remember to turn the handle back after use. More … to learn more about all of the exciting features of the Instant Pot Ultra 6 Qt 10-in-1 Multi-Use Programmable Pressure Cooker visit the Instant Pot Features page. Replaces 10 small kitchen appliances thus saving your precious counter and cupboard space as well as money. Built-in programs take the guesswork out of cooking for newbies and busy cooks that just want to set-and-forget. Fully programmable settings for more serious cooks that want full control and personalization. High-pressure setting reduces cooking time. Low-pressure setting prevents overcooking of delicate foods. Energy efficiency design saves up to 70% of energy use. The central control dial organizes programming and settings adjustment in a clear, easy to use manner. No more searching the control pad to find the right setting. 30-day “no hassle” return policy includes shipping if replacing a damaged, defective or incorrect item. If you simply don’t want it, a $20 shipping fee applies. Who is the Instant Pot Ultra For? The Instant Pot Ultra 6 Qt. 10-in-1 Multi-Use Programmable Pressure Cooker is for anyone looking for a multi-function cooker with smart programming. For newbies and busy cooks, the built-in programs are ideal, bachelors rejoice. On the other hand, for experienced cooks that want more control and aren’t intimidated by modern digital programming, the Ultra programming feature is awesome. For some, this may be too much of a good thing. Maybe you are looking for a simple slow cooker without all the bells and whistles. In that case, visit my Small Kitchen Appliances For You / Slow Cookers page for more options. Amazon customers rate the Instant Pot Ultra 6 Qt 10-in-1 Multi-Use Programmable Pressure Cooker a very high 4.3 out of 5 stars. 83% of the reviews give it 4 or 5 out of 5 stars. Fakespot found over 80% of the Amazon reviews to be high quality and give them a Grade B. The Instant Pot Ultra 6 Qt. 10-in-1 Multi-Use Programmable Pressure Cooker fulfills expectations perfectly, doing the job of several other small appliances with less counter space, high efficiency, high quality, ease of use and ease of cleaning. I give the Instant Pot Ultra 6 Qt. 10-in-1 Multi-Use Programmable Pressure Cooker 90 out of 100 and recommended Buy. 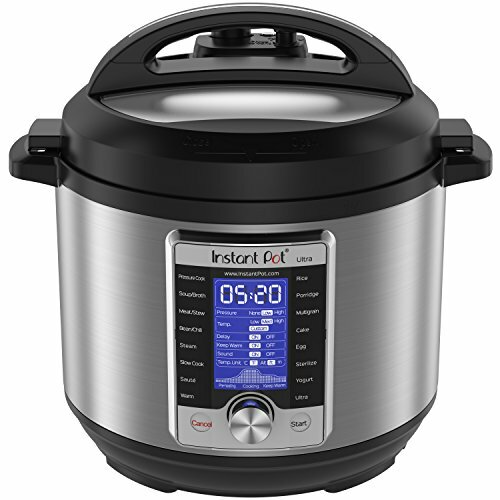 Do you have an Instant Pot Ultra 6 Qt. 10-in-1 Multi-Use Programmable Pressure Cooker? What is your opinion? Please leave your comments or questions in the comment box below. Thanks for your review regarding the Instant Pot Ultra. We’re currently contemplating cooking with a pressure cooker for convenience to be honest. To cook shin beef tender in 30 minutes, breaking down all the sinews to release the wondrous gravy delivers the tastiest meal in quick time. We currently cook on low heat for a day in a slow-cooker however the time it takes to prepare the meal the night before especially after you’ve just finished a meal has become rather a laborious duty, this pressure cook method solves the problem and brings the traditional way of cooking back to our homes. I remember Mum cooking this way years back once we got home from school. We did the washing up whilst she prepared the meal, tea ready in half an hour from scratch, wholesome too. You mention ease of cleaning. Does the pot inside the pressure cooker come out for dishwasher cleaning or is it fixed in? Thanks for the comment and question. Yes, the inner cooking pot is removable and dishwasher safe. It is made of food grade 304 (18/8) Stainless Steel with no chemical coatings and has lines at the ½ and 2/3 marks for max fill pressure cook safety. Hope that I was able to help you make a decision on a new pressure cooker. Next PostNext Crock-Pot Express Crock Programmable Multi-Cooker Review – Best Priced Multi-Cooker For You?